As a perfume lover, exploring new scents is a never ending obsession of mine. Lately I’ve been turning to niche perfume artisans and apothecaries – places you’ll find the purest and freshest, not to mention the most exotic, complex, and experimental scents – ones that have the power to transport you to different seasons, places, and spaces in time. If you too are looking to mix up your perfume collection, here are 5 natural botanical perfume apothecaries that offer truly enchanting, one-of-a-kind scents. For Strange Women is a “natural botanical perfume from a strange apothecary” created my Jill, the owner and alchemist. Her scents are handmade using botanical ingredients from around the world, and invoke a vintage and often times otherworldly charm. In her shop, you’ll find everything from single note solid perfumes and oils, simple two note blends, and more complex vintage, earthy, and ethereal perfume blends. You can sample scents through a set or individually. My personal favorites: Winter Kitty™, Moss & Ivy™, and Decadence and Debauchery™. The Parlor Apothecary offers a collection of handmade perfumes and oils with an old-world charm. In their shop, you’ll find both mystical and earthy blends, grouped into their Potions, Casting Spells, Elements, and Into The Woods sets. They also have a wide range of Victorian-inspired eau de toilette perfumes, which you can sample here. They also offer a variety of skincare and jewelry, like lip balm lockets, message in a bottle necklaces and gorgeous antique-style atomizer bottles. Ravens Court Apothecary is a vegan apothecary for tea and book lovers. Their scents are inspired by literature, tea, and the rich simplicity of nature. 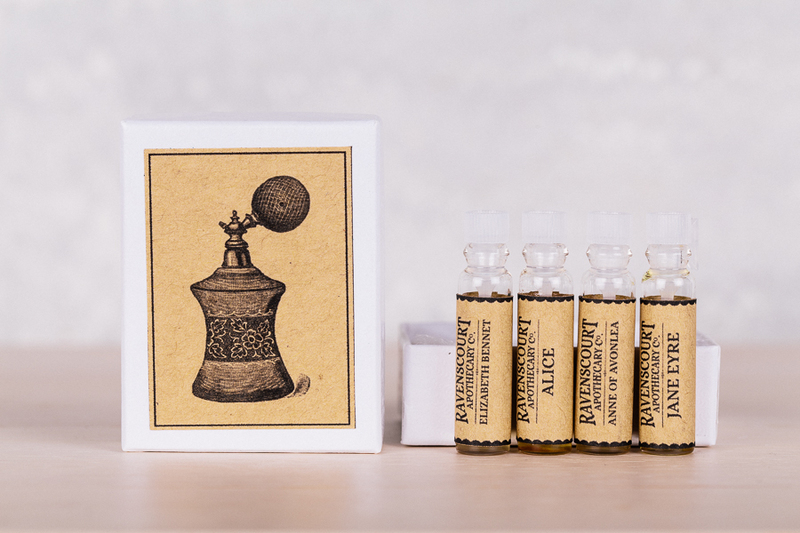 For example, four of their botanical fragrances are named after literary heroines: “Alice”, “Jane Eyre”, “Elizabeth Bennet” and “Anne of Avonlea”, and heroes too, including “Mr Darcy”, “Mr Rochester”, “Heathcliff” and “Dorian Gray”. They also sell an assortment of natural handmade soaps, bath salts, lip balms, body butter, and more. Alchemologie was created by Julianne Zaleta, a professional perfumer, aromatherapist & herbalist. Her perfumes range from rich forest scents, romantic floras, and even unique aquatic scents, like Florida Water. They’re created to invoke the feeling of a certain time and place, like Juke for example, which transports you to a hot and humid night filled with dancing, drinks, and jazz, with a touch of tobacco and spice. Another unique blend is Swamp Water, which combines heavy florals with grassy and woodsy notes, topped with a hint of jasmine tea and citruses. Nina, the owner and perfumer at Midnight Gypsy Alchemy offers handcrafted, natural artisan perfume oils inspired by the art of ancient alchemy and botanical perfumery, as well as her own Spanish Gypsy heritage. Nina’s uniquely scented products are created to ‘invoke a sense of ancient alchemy and gypsy lore using plant gifts of nature and transforming them into beautiful sensory moments‘. She currently offers sample sets where you can pick four scents to try out. Two of my personal favorites include Winter Gypsy, which captures ‘the essence of winter snow and scents of the season in a forest inspired scent‘, and The Owl Moon, which invokes ‘a bit of owl and moon magick in a wooded earth scent with hints of smokey vanilla undertones‘. Are you a natural perfume lover? Have a favorite apothecary or scent?